what happens after the biopsy, and what to do when you get home. It is common for children to be worried about a kidney biopsy. A team of healthcare professionals will help you and your child prepare for it, so you know what to expect. A kidney biopsy is a procedure in which a tiny piece (sample) of a kidney is removed from the body. This sample is examined under microscopes to find out more about the kidney’s health. Why does my child need a biopsy? for children who have had a kidney transplant, check for any problems. Most of the time, a kidney biopsy is planned in advance. Occasionally, it needs to be done urgently while a child is in hospital. Only a tiny sample of the kidney is taken, so the procedure does not affect how the kidneys work. It is very rare for a kidney biopsy to have serious complications, or problems. Occasionally the doctor is not able to get a good enough sample in the first biopsy. This can happen in up to 5 of 100 biopsies. If this happens, your child may need to have another biopsy. No surgical procedure is completely without risks, and it is important that you understand these. Your doctor will speak with you and your child about the possible problems with a kidney biopsy before you consent (agree) to the procedure. These complications happen in more than 1 in 100 biopsies. Pain and bruising at the biopsy site (where the needle is inserted) – this normally goes away after a few days. You may give your child paracetamol to help with any pain – but do not give ibuprofen unless your doctor tells you otherwise. Visible blood in the urine (wee) – this can happen in up to 10 in 100 biopsies and normally stops within 24 hours. Your child’s urine may look pink or red. Blood clots (where the blood clumps together) in the urine – these only happen when there is visible blood in the urine. They usually resolve (get better) without treatment, but occasionally need to be “flushed out” with a catheter, a plastic tube that is passed through the urethra (the tube that your child wees out of) and into the bladder, so that the blood clots can be removed. These complications happen in fewer than 1 in 100 biopsies. Infection around the biopsy site, or rarely, in the kidney – you can help reduce this risk by keeping the biopsy site clean and dry. An infection needs to be treated with antibiotics, medicines to kill the germs. Very occasionally a minor operation to drain the infected blood is needed. Heavy bleeding in the urine – some children who get heavy bleeding need a blood transfusion to receive new blood from a donor. A small number need a minor operation to stop the bleeding. Joining of two types of blood vessels in the kidney (fistula) – this normally causes no problems and gets better on its own. Occasionally, a fistula leads to bleeding or problems with blood pressure and will need surgery to treat it. Most of the time, these complications are found before a child leaves the hospital. Occasionally, children need to go back to hospital. A kidney biopsy is usually done when other tests have not been able to identify the cause of a kidney problem. The alternative is not to have the biopsy, but rather to use other tests to guide treatment. This may mean that your child does not get a specific treatment that might have been identified by the kidney biopsy results. You can discuss any alternatives with your doctor. Your child will be admitted to the paediatric renal unit on the day or one day before the biopsy. The kidney biopsy will take place in an operating theatre, the radiology department or a treatment room on the ward. On the day of the biopsy, or at an earlier visit, your child will need some tests. These include blood tests, urine tests and a blood pressure measurement. The team of healthcare professionals looking after your child will make sure he or she is as comfortable as possible. They will use sedation or anaesthesia – medicines so your child does not feel pain during the procedure. Most children are asleep for the procedure and so will not feel the biopsy. The doctor uses an ultrasound scanner to help find the right part of the kidney. This shows pictures of the inside of the body. It is similar to the scan that many women have when they are pregnant. After your child has medicines to go to sleep or stop feeling pain, the doctor will make a small cut in his or her skin. The doctor will insert a needle with a hollow centre through the cut and into the kidney and remove one or more small samples of kidney. Children who have a history of bleeding problems, such as a blood-clotting disorder, or who have only one kidney, may need to have a different type of biopsy. Your doctor will discuss this with you. After the biopsy, your child will return to the hospital ward, where he or she will rest and be monitored. If there are no problems, your child may be able to go home after about 6 hours, though sometimes an overnight stay is needed. Some children will continue to have a little blood in their urine after they get home. If your child continues to have visible blood in their urine after 24 hours, contact the hospital. your child feels faint or dizzy. Your hospital staff will give you more information about when your child can go back to school or daycare and start doing their usual activities. It can take several weeks to get the full results from the biopsy because of the different ways in which the kidney samples are examined. The amount of time depends on your hospital. Your doctor will let you know about a follow-up visit to talk about the biopsy results and what they mean. A kidney biopsy is a procedure where a tiny piece (sample) of a kidney is removed from the body. This sample is examined under microscopes to find out more about the kidney’s health. The kidneys are part of the urinary system, which gets rid of things that the body no longer needs, so that we can grow and stay healthy. The kidneys are bean-shaped organs. They filter blood and remove extra water, salt and waste in urine (wee). Most of us have two kidneys. They are at the back on either side of our spine (backbone), near the bottom edge of our ribs. Your child’s specialist doctor – a paediatric nephrologist – may recommend a kidney biopsy. A kidney biopsy can help your doctor diagnose (identify) a condition, so that the most appropriate treatment can be started. It may be done when other tests have not been able to give enough information. poor kidney function (how well kidney is working), which can quickly become worse without a known cause. If your child is being treated for a kidney condition, a kidney biopsy can help find out how well their kidneys are responding to treatment. may not be working as well as previously. Occasionally, a kidney biopsy needs to be done urgently while a child is in hospital. This is to find out information about the kidney if it has suddenly stopped working as well as it should. It is very rare that a kidney biopsy has serious complications, or problems. Your child will have tests before the biopsy to check that they are well enough for the procedure. After the biopsy, he or she will be monitored for any complications before they go home. However, no surgical procedure is completely without risk, and it is important you understand the risks. Your doctor will speak with you about the possible problems with a kidney biopsy before you agree to the procedure. As a parent or main carer of your child, you will need to give your consent (agreement) before the biopsy. You will need to sign a form that confirms you understand why the biopsy is being done, the alternatives, the complications and risks, and that you agree to the procedure. The following problems happen in more than 1 in 100 biopsies. Most children have a small amount of pain or a dull ache around the biopsy site – the area where the needle was inserted. You may give your child paracetamol, usually for 1–2 days, to help with any pain, unless your doctor tells you not to. Give the medicine at least 4 hours apart, and do not give it more than four times in 24 hours. You may also talk with your doctor or nurse about other ways to help your child with any pain or discomfort. Do not give your chid ibuprofen unless your doctor tells you otherwise. A few children have bruising around the biopsy site. In most children, the bruising and the pain go away after a few days. 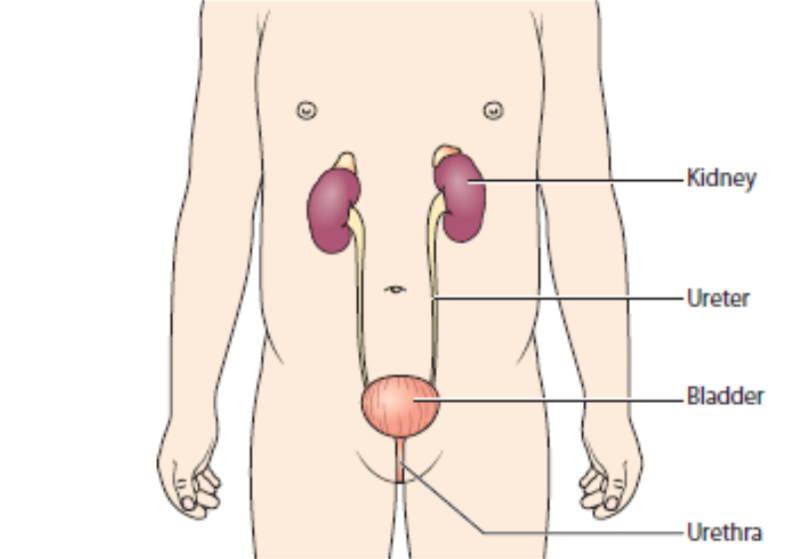 The kidney has many blood vessels (tubes that carry blood round the body). When a needle is inserted, there will almost always be a small amount of bleeding in the kidneys. In most cases, the bleeding stops within the kidney, the body heals naturally, and there are no problems. Often, there is a small amount of blood in the urine, which you may not be able to see – this normally stops after a day. In up to 10 in 100 kidney biopsies, children have more blood in their urine after a biopsy. Your child’s healthcare team will check for this after the biopsy and before your child goes home. Your child’s urine may look pink or red. Sometimes there is blood in the urine for about 24 hours after the biopsy and in most children this goes away without needing any treatment. One way the body works to stop bleeding is to form a blood clot – the blood clumps together. If your child has visible blood in his or her urine, he or she will be encouraged to drink plenty of fluids and go to the toilet regularly to help stop blood clots forming in the urine. If your child has signs of blood clots, your doctor may use an ultrasound scanner to find the clots. The clots are almost always small enough to pass into the bladder, where urine is stored. Sometimes, clots need to be “flushed out” of the body using a urethral catheter, a long plastic tube. Your doctor will place the catheter through your child’s urethra (the tube that he or she wees out of) and into the bladder, so that the blood clots can be removed. This is needed in 2 in 100 children who have had a kidney biopsy. Occasionally, the doctor is not able to get a good enough sample in the first biopsy. This can happen in up to 5 of 100 biopsies. If this happens, your child may need to have another biopsy. Your doctor will explain what should happen next. The following problems happen in fewer than 1 in 100 biopsies. A small number of children have very heavy bleeding, and there is a large amount of blood in their urine. Some of these children need to have a blood transfusion. This is only needed in about 1 in 100 children who have had a biopsy. In this procedure, blood is taken from a donor (a person donating some of his or her blood) and put into your child’s body (as the recipient). Usually, a plastic tube (a cannula) is inserted into a blood vessel in the arm, and the blood is passed through. Blood is usually given over 3–4 hours. In less than 1 in 100 children who have had a biopsy the bleeding does not stop on its own and an operation is required to stop the bleeding. A very small number of children get an infection following a biopsy. This can be in the skin around the biopsy site or, more rarely, in the blood around the kidney. You can help avoid this by keeping the biopsy site clean and dry for a few days after the procedure. If your child gets an infection, he or she will need to take antibiotics, medicines that kill the germs that cause the infection. Very occasionally, children need a minor operation to drain, or remove, the infected blood. The body has two types of blood vessels, which carry blood around the body. Very occasionally, a biopsy needle damages the walls of a nearby artery and vein. This causes an abnormal connection between the two blood vessels, which is called an arteriovenous fistula, or fistula. Most of the time, a fistula causes no problems, and the connection closes on its own. Rarely, it leads to bleeding or problems with blood pressure. If your child has these problems, your healthcare team will use an ultrasound scanner to find out whether there is a fistula. Rarely, children need surgery to treat this. For most children with complications after a biopsy, the problems are found while they are still in hospital. Your doctor will give you information on what to do when you get home to avoid any problems, and what to look out for. Approximately 1 in 100 children need to go back into hospital. You and your child will meet with your doctor and the healthcare professionals involved in the kidney biopsy. They will make sure that your child is prepared for the procedure, and provide you with the information you need. Your child will need to come in for a whole day, and sometimes overnight, for a biopsy. Your child will need some tests before the biopsy – which will take place on the day of the biopsy or at an earlier visit. Your child will not be able to take some medicines before the procedure. These include non-steroidal anti-inflammatory drugs such as ibuprofen (eg Brufen©) and aspirin. Your doctor or nurse will give you more information. Your doctor will ask whether your child has any allergies. Your child will need to stop eating or drinking anything for some time before the biopsy. Your doctor or nurse will give you more information. Some hospitals have a play specialist, who may be able to meet with your child. He or she will use dolls and other toys to help your child understand and feel less worried about the procedure. You may like to bring some of your child’s favourite toys, games and books. If your child is spending the night in hospital, you will need to bring their nightclothes, toiletries and a change of clothes. Speak with your doctor or nurse about any arrangements to stay near your child. Blood tests will confirm whether your child is well enough for the kidney biopsy, and that he or she has the right type of biopsy. These tests may be a few days before the procedure, or on the day of the admission. A small amount of blood will be taken from a blood vessel, with a needle and syringe, and tested in a laboratory. One blood test is used to find out whether the blood is clotting properly. Clots form in the blood to heal a wound, such as a cut in the skin, and it is important to know that your child’s blood will clot as expected after a biopsy. A full blood count counts the number of different types of blood cells, including platelets, which help blood to clot (thicken) to stop bleeding. If there is a low number of platelets, there is a higher risk of bleeding. In a group and save, a small sample of your child’s blood is stored to be used in the rare event that your child needs a blood transfusion (if they have heavy bleeding). The hospital will be able to find out your child’s blood group, so they can get the right type of blood from a donor. Your child’s blood pressure will be checked. It is important that your child’s blood pressure is in a safe range before the biopsy. If it is too high, the procedure may be delayed until another day. Your child may be given medicines to control their blood pressure. A urine test can check for substances in a sample of your child’s urine. A dipstick will be dipped into the urine – this is a strip with chemical pads that change colour depending on what substances are in the urine. Your child will be taken to the room where the kidney biopsy will take place. It normally takes about one hour. If your child is having local anaesthetic, you can usually stay with him or her during the procedure. It is important that your child is as comfortable and pain-free as possible during the biopsy. Your hospital will use sedation and/or anaesthesia – your doctor will speak with you about the best options for your child. Sedation is the use of medicines (sedatives) to go into a sleep-like state. This medicine may be injected into a blood vessel using a cannula, a plastic tube. This medicine may also be breathed in during the procedure, using a hand-held mouth piece. After the biopsy, your child can breathe air normally and the gas quickly stops working. One type is a mixture of nitrous oxide and oxygen, the same as “gas and air” that some women use during childbirth. Anaesthesia is the use of medicines (anaesthetics) to avoid feeling pain. There are two types of anaesthesia. Local anaesthetic: this medicine is put on a particular area of the body to avoid feeling pain there. In a kidney biopsy, the medicine is injected into the skin where the cut will be made for the needle, and into the muscle under the skin and over the kidney. This is so your child does not feel pain when the needle is pushed down towards the kidney. General anaesthetic: This medicine makes your child go to sleep so they do not feel pain anywhere in their body, as well as making sure they keep still during the biopsy. A general anaesthetic may be given as a gas that your child will breathe in, or it may be injected into a blood vessel. The doctor makes a small cut in the skin. He or she inserts a needle with a hollow centre through the cut and into the kidney and removes one or more small samples of kidney. If your child is having a biopsy of their own kidney, he or she lies on their tummy or side (because the kidneys sit near the back of the body). If the biopsy is on a transplanted kidney, he or she will lay on their back (because a transplanted kidney is usually near the front of the body). The skin where the biopsy needle will be inserted is cleaned with an antiseptic, which makes sure the area is completely clean. The doctor makes a very small cut into the skin – about 2–3 mm wide. The doctor then inserts the biopsy needle through the cut. If your child is awake, he or she may be asked to take a breath and hold it for a few seconds. Your child should not feel any pain, though they may feel some pressure. He or she may also hear a sharp, clicking noise. The biopsy needle has a hollow centre, and when it is removed, it brings a very small piece of kidney with it. This will be about 1–2 cm long. Your doctor may need to do this a few times to get a good sample. When the doctor has finished, the biopsy site is covered with a dressing. It often oozes a little after the biopsy, but this will stop when pressure is applied to the site. Your child will go back to the hospital ward to rest in bed, usually for about 6 hours. After a biopsy, children often need to lie flat for 2 hours and then sit up for 4 hours – this helps avoid bleeding from their kidney. If your child has had general anaesthetic or sedation, he or she may feel drowsy for a little while, as they “wake up”. Your child can read or look at books, do homework, or play with toys – as long as they stay resting. Your doctor will let you and your child know what he or she can eat and drink. A team of healthcare professionals will monitor your child after the biopsy to make sure they are recovering well. The urine that your child passes will be collected in a pot, and the nurse will test it for blood. If your child is well after the biopsy, has no complications, and no or little blood in his or her urine, he or she can probably go home about 6 hours after the procedure. If the biopsy took place late in the afternoon, your child may need to stay overnight and go home the following morning. Your child’s healthcare team will have checked for any blood in his or her urine. Some children will continue to have a little blood in their urine after they get home – the urine may be dark brown (like a cola drink) or red (like Ribena). This should stop after a day. If your child continues to have visible blood in his or her urine after 24 hours, contact the hospital. Keep the dressing dry and in place for 2–3 days after the biopsy. This will help it to heal. The scar from the needle is very small. Check with your doctor or pharmacist before giving any other medicines to your child, for a few weeks after the biopsy. This includes herbal and complementary medicines, and medicines that you can get over the counter. Your hospital staff will give you more information about when your child can go back to school or nursery – this is usually after 2 days – and start doing their usual activities. Often your child will need to avoid running around or riding a bike for 1 or 2 weeks, and avoid contact or impact sports for up to 4 weeks – these include rugby, football, jumping on a trampoline or horse riding. It can take several weeks to get the full results because of the different ways in which the kidney samples are examined. The amount of time depends on your hospital. The results will give your doctor more information to help them give a diagnosis or find out the best treatment for your child. Your doctor will let you know about a follow-up visit to talk about the biopsy results and what they mean. The small pieces of kidney that are removed in a biopsy must contain several glomeruli and one or more arteries, a type of blood vessel. The glomeruli are like the tiny filters of the kidney. They are in the outer part of the kidney, which is called the renal cortex. Because the kidneys have about one million glomeruli, just taking several from one kidney will not affect how it works. Hospital staff will look at the sample from your child’s kidney in three stages. Light microscopy – first, the sample is looked at under a microscope, usually within 1 or 2 days of the biopsy. Immunofluorescence – next, a special stain is added to the sample to show any chemicals that may be harming the kidney – this usually happens within several days. Electron microscopy – a special, large microscope called an electron microscope is used to see the glomeruli in fine detail – this usually happens within several weeks. Occasionally, the doctor is not able to get a good enough sample for the biopsy to make a diagnosis. If that is the case, your child may need another biopsy. Your doctor will explain what should happen next. This is the end of the information on kidney biopsy. If you would like to read more about kidney conditions, other tests, treatment or supporting information, you can find a list of topics covered on the infoKID website at www.infokid.org.uk.